This is an employment guide for job seekers in the St. Lucie Florida region. This St. Lucie Florida job guide is a resource for job seekers looking for legitimate job openings in the region with an emphasis on local government employment, healthcare careers, school teaching / support staff positions, local industry opportunities, and a listing of job boards. Use the links below to view a wide range of employment opportunities currently available. St. Lucie County often has open positions available. Here you can find employment opportunities such as Civil Engineer, Plumber, Equipment Operator, Foreman, GIS Analyst, Jail Maintenance Specialist, Maintenance Technician, Recreation & Pool Attendant Jobs, Pool Lifeguard, Librarian, Library positions, Clerk, Administrative Assistant, Secretary, Youth Services Jobs, Survey Technician, Recreation Jobs, and more. The St. Lucy County Sheriff's Office is a full service law enforcement agency that offers careers for certified and non-certified civilian support staff. Here you'll find opportunities such as Detention Deputy, Court Security Deputy, Law Enforcement Deputy Sheriff, and Civilian Clerk. The St. Lucie Clerk of the Circuit Court hires for positions such as Record Clerk, Internal Audit Specialist, Court Reporter, Attorney, Court Officer, and a variety of other positions as they become available. 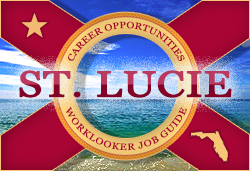 St. Lucie County Tax Collector periodically hires for positions such as Customer Service CSR I, Finance Director, and Quality Assurance Team Member. Periodically positions become available.Their site indicates that they employ professionals with excellent communication skills, relevant experience, the ability to adapt to an ever-changing environment, and dedication. Port St. Lucie often has ongoing opportunities for permanent and seasonal employment. Here you may find job opneings such as Business Navigator, Office of Management & Budget Director, Field Technician Trainee, Maintenance Worker, Community Center Recreation Aide, Minsky Gym Recreation Aide, Civic Center Recreation Aide, Records Supervisor, Sports Instructor, Soccer Instructor, School Crossing Guard, Seasonal Jobs, Strategic Planner, Fitness Instructor, Summer Camp Aide, Bus Driver, Full-time City Jobs, Youth Worker, and Landscape Specialist. 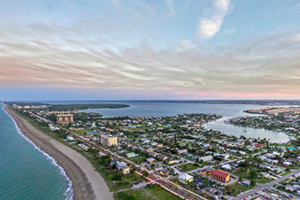 Fort Pierce is a great resource to check for a variety of job postings. Here you may find open positions such as Maintenance Worker, Building Official, Equipment Operator, Police Officer, Garage Foreman, Diesel Mechanic, Solid Waste Jobs, School Crossing Guard, Automotive Mechanic, Community Service Officer, Community Service Aide, IT Systems Administrator, Media Specialist, and Police Information Systems Administrator. St. Lucie Medical Center is a 229-bed, hospital offering a full range of acute care services, including rehabilitation, obstetrics, inpatient and outpatient surgery and services. HCA has an abundance of ongoing career opportunities for a wide range of healthcare specialties, as well as rewarding support staff positions. Open positions you might find include Operating Room Technician, Radiology Technician PRN, Food Service Worker, Environmental Service Worker, Floor Care Technician, Mental Health Technician Behavioral Health, Ultrasound Technician, CT Scan Technician, Emergency Paramedic, Registered Nurse PRN, Laboratory Assistant, RN Jobs, Enviornmental Services Associate, EKG Technician, Patient Transporter, PRN Nursing Jobs, Registered Nurse PCU, Registered Nurse Behavioral Health PRN, Registered Nurse RN Emergency PRN, Ultrasound Technician, Cat Scan Technician, Respiratory Therapist PRN, Physical Therapy Assistant PRN, Physical Therapist PRN, Registered Nurse Operating Room, Medical Technologist, ICU Nurse RN, Registered Nurse Case Manager, Registered Nurse Orthopedics, Registered Nurse Intensive Care Unit, and Monitor Technician. Lawnwood Regional Medical Center & Heart Institute is a 365-bed acute care hospital that is now hiring. This hospital has an ongoing high volume of opportunities available. Openings may include positions such as Chief Medical Officer, CNA, Registered Nurse Recovery Room, Pharmacy Technician Job, Cerified Nursing Assistant PRN, Physical Therapist, PRN Registered Nurse Jobs, Occupational Therapy Assistant, PRN OT Job, Floor Care Technician, Food Service Worker, Med/Surg Unit Jobs, Food Service Worker Clerk, Cashier, Licensed Social Worker, PICU Nursing Jobs, Radiology Technician PRN, Registered Nurse Trauma Neuro, Registered Nurse Pediatric Intensive Care Unit, Paramedic, Registered Nurse Manager Behavioral Health, Environmental Service Worker, Registered Nurse Surgical Intensive Care Unit, Pharmacy Technician PRN, Echo Technologist, Nursing Assistant Jobs, Radiology Technician, Clinical Pharmacist, Physical Therapy Assistant PRN, Registered Nurse Neonatal Intensive Care Unit, Cat Scan Technologist, Cardiac Cath Lab Technician, Nurse Operating Room, and Registered Nurse Stress Lab. Port St. Lucie Hospital is a 75-bed, inpatient mental health facility located on 20 acres near the beautiful Savannas Preserve. Through their careers page you can inquire about current employment opportunities. CareSpot Urgent Care is a provider of urgent care, occupational health and wellness services in Port St. Lucie and South Fort Pierce. Here you may find periodic opportunities such as Nurse Practitioner, Physician Assistant, Medical Assistant PRN, Physician, Certified Coding Specialist, A/R Billing Specialist, and more. St. Lucie Women and Children Center is a part of Florida Community Health Centers, a comprehensive health care system with over 400 employees. They provide pediatric and adult primary and preventive care; preventive and restorative dental services, OB/GYN services and HIV/AIDS care. Here you may find open positions such as Certified Medical Assistant, LPN Nurse Manager, Family Medicine or Internal Medicine Physician, and more. Martin Health System is the only not-for-profit hospital in St. Lucie and Martin counties. Note: Tradition Medical Center will double in size, with a total of nine stories and 90 new patient rooms. Hot jobs include Surgical Tech, Registered Nurse RN Ortho, HVAC Tech, Electrician, HR jobs, ICU RN jobs, Oncology Nursing Jobs, Medical Technologist, Med / Surg Nursing jobs, Telemetry Nurse, and more. Life Care Center of Port St. Lucie periodically has opportunities such as Registered Dietitian, RN Unit Care Coordinator, RN Unit Registered Nurse, and Social Services Assistant. St. Lucie Public Schools is a growing district and is the largest employer on the Treasure Coast of Florida with over 5,000 employees. This is a great resource for finding an ongoing variety of teaching jobs. Here you may find jobs such as School Custodian, Athletic Coach, Food Services Assistant, School Maintenance jobs, Site Maintenance Worker, Paraprofessional Jobs, ESOL Spanish, Aides-Paraprofessional, Pre K Teacher, Preschool Paraprofessional jobs, Behavioral Analyst, School Principal, School Security, Bus Aide, School Bus Driver, Substitute Teacher, Teacher Aide, 9th - 12th Grade Teacher, ESE Teacher, Teacher Autism, Teacher Gifted, Teacher Intellectual Disabilities, Speech Language Pathologist, Math Teacher, School Counselor, 1st Grade Teacher, 8th Grade Teacher, 3rd Grade Teacher, PE Teacher, Vocational Teacher, and more. Renaissance Charter School of St. Lucie and Tradition offer classes in grades K-8. Here you can periodically find employment opportunities such as Custodian, 1st Grade Teacher, Social Studies Teacher, Permanent Substitute, Before/Aftercare Worker, Full Time Day Custodian, Daily Substitute, Kindergarten Teacher, 3rd Grade Teacher, 2nd Grade Teacher, Special Education/ESE Teacher, Title 1 Math Intervention Teacher, MS Physical Education Teacher, English Language Arts Teacher, Foreign Language Teacher, Social Studies Teacher, 5th Grade Teacher, Tutor, Science Teacher, Math Teacher, and Technology Teacher. Chesterbrook Academy offers rewarding career opportunities within a caring educational community. Periodically positions become available for Preschool Assistant Teacher and Preschool Teacher. YMCA of the Treasure Coast has locations in Stuart, Port St. Lucie, Indiantown, and Okeechobee. At various locations there may be opportunities such as ChildWatch Staff, Bus Driver, Lifeguard, Afterschool Staff, Teacher, Co-teacher, Preschool Floater, Preschool Teacher, Substitute Preschool Teacher, and Lead Teacher. IRSC offers a wide range of degree and certificate programs, including Baccalaureate Degrees, Associate in Arts, Associate in Science, and Associate in Applied Science degrees, as well as shorter term certificate and Adult Education programs. Ongoing employment opportunities are often posted. Here you may find jobs such as Part-Time Technical Assistant ESL, Bus Driver, Master Instructor, Adjunct Instructor, Sign Language Interpreter, Bookstore Clerk, and Child Development Center-Subsitute Teacher. Sworn and non-sworn members of are committed to providing responsive, quality, cost effective service to the citizens of St. Lucie County. The St. Lucie County Sheriff's Office is currently in a hiring freeze. Applications are not being accepted for any position. Check back for updates. Use the Sheriff's website for updates regarding then the hiring freeze will be lifted. The police department is organized into five bureaus, consisting of Staff, Support Operations, Investigative Services, Neighborhood Policing Districts. At time of review Fort Pierce Police Department was hiring officers and support positions. The Mission of the Port St. Lucie Police department is to provide safety and security to all citizens and establishing a partnership with the community. The St. Lucie County Fire District reacts to fire and medical emergencies and assists other agencies when called upon. The Fire District has 17 stations and over 400 employees. In order to become a Police Officer or Deputy Sheriff in St. Lucie County you must first attend a Police Academy that meets Florida's requirements for Law Enforcement certification. The Treasure Coast Public Safety Training Police Academy at Indian River State College (IRSC) is the most advanced police training facility in the nation and is certified by FDLE/CJSTC to conduct authorized training. After completing the academy students can sit for the Florida Certified Law Enforcement Officer Exam. Applicants should seek out an agency that will pay your way through the academy (salary + paid tuition) or learn if other sponsorship agreements are available. The Basic Fire Recruit Academy meets the educational requirements to become a certified firefighter in the State of Florida. Upon graduation, individuals can sit for the written state and practical exams administered by the Bureau of Fire Standards and Training. Applicants must have completed the EMT or Paramedic training program and passed the State/national certification exam prior to admission. This is a great jobs resource. During this review jobs were available such as Physician, Registered Dietitian, Massage Therapist, Life Care Center of Palm Bay Activity Assistant, Part-time After School Elementary Assistant, Animal Care Technician, Childcare Worker, Lifeguard jobs, Nail Technician, Dental Assistant, Preschool Director, Summer VPK Teacher, Pre-K Teacher, Receptionist, Certified Nursing Assistant CNA, Dental Receptionist, Nursing Aides, Housekeeping Cleaners, Licensed Practical Nurse LPN, Housekeeping Supervisor, Home Health Aide (HHA) / Merritt Island, Accountant, CDL Bus Driver, Welder, Certified Welder, Registered Nurse RN Cardiac Cath Lab, RN Case Manager, and Marine Service Technician. Looking for a job working for the State of Florida? People First is an updated database of employment listings for the various departments within Florida government that include careers in various specialties such as health care, public safety, law enforcement, corrections, conservation, community and social services, science tchnology engineering and mathematics, administrative and office support, management, education, and more. The Florida Workforce System connects employers with qualified, skilled talent and Floridians with employment and career development opportunities to achieve economic prosperity. The St. Lucie Chamber of Commerce is a great resource to use for exploring area businesses by using their directory, learning about the overall economic climate, workforce information, and more.